Albert Einstein. His was the brain that changed everything. One of the planet’s greatest scientists, most people think of him as a master of logic and a very rational thinker. But left-brain thinking wasn’t at all his greatest strength. A self-proclaimed right-brainer, Einstein himself said: “I never made one of my discoveries through the process of rational thinking”. Reading his biography, you’ll discover his discoveries were made by imagining, dreaming and looking at the really big picture. He said: “It’s not that I’m so smart, it’s just that I stay with the problem longer”. He would sit under a tree and imagine ‘what if’, then he’d often invite his left-brain friend, Max Plank, to ‘do the math’. 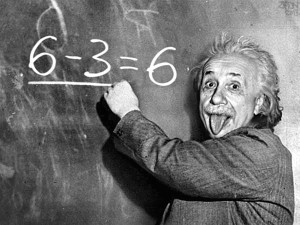 Of course, Max himself would never have dreamed what kind of math to do if Albert hadn’t dreamed up the whole concept. As Albert said: “I rarely dream in words at all”. All of his ground-breaking theories came about basically by dreaming, by engaging his right brain to imagine the possibilities. We all dream in ‘video’. Think about it. You don’t dream about text floating by, you dream in moving images, situations that are like watching videos while you sleep. That’s the right brain at work. So it makes sense that we get excited when we see video in our waking hours – beautiful, inspiring images with a stirring soundtrack, that’s what moves us. Text, numbers, logic, all stuff of the left brain… none of that really counts.